Cloud Application Studio supports the automated distribution of a Solution. If any solution is hosted on a same physical system and solution exists in more than one different tenants of a same customer, then Solutions are automatically updated after the import of the solution. This Functionality helps to re triggers the automatic upload and activation of the solution in tenants where deployment has been unsuccessful. NOTE – This functionality will only work if the lower version patch of the solution exist or at least the first version of the solution is already deployed in those tenants. If not then the deployment of Version 1 of the solution into any tenant has to be done manually. 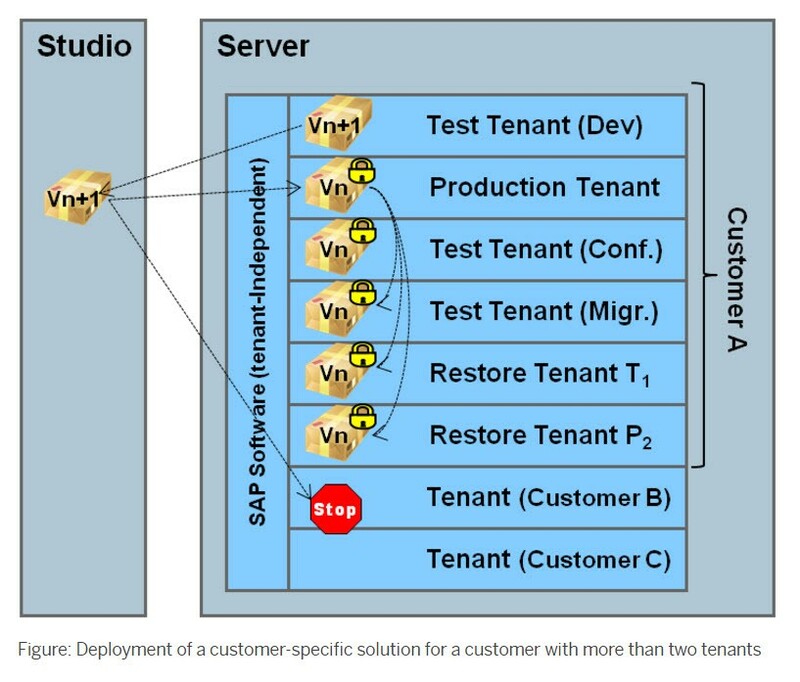 In this section, we can see the deployment of customer-specific solutions for customers with multiple tenants, for example for a customer that has one production tenant and several test tenants, for example for custom development, testing, migration tests and so on. Development and patch development (updates) of the customer-specific solution is done in a dedicated tenant. The development version is only visible in this tenant. Updates are imported into the production tenant (PRD). 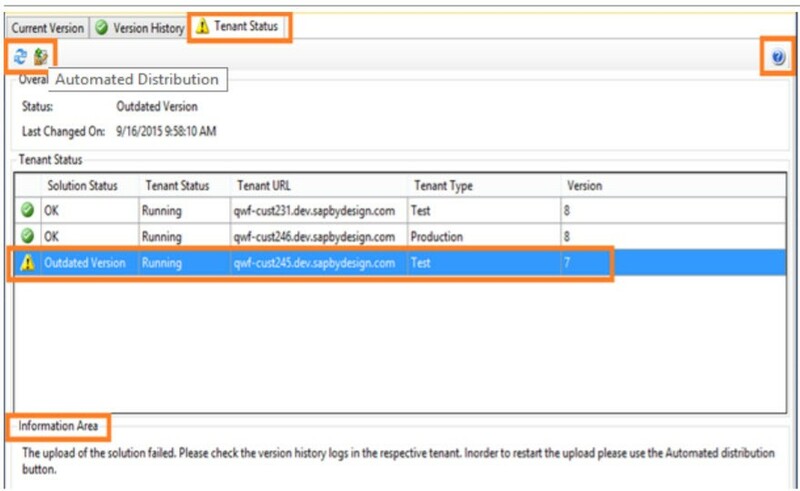 Additional tenants of the same customer are updated automatically after import of the update into the PRD tenant. In other words there are at maximum 2 versions of the software available in the landscape: one version for update (patch) development (in a dedicated TST tenant) and one version for the PRD tenant and all other tenants. The additional tenants are updated with the latest patch only if the first version is already deployed in those tenants. The deployment of version 1 of the solution into any tenant is to be done explicitly. Once a solution has been successful deployed and exists in a lower version in other tenants in the same system, then you can use the automated distribution function to restart the distribution process in those tenants. The system triggers the upload and activation of the solution in those tenants through the SAP_SYSTEM user, and not with the service agent user. Now if the deployment of solution to higher version happens or an Upgrade takes place and if you still see an yellow indicator in tenant status tab of the Implementation Manager. Then you can use this functionality which re triggers the automatic upload and activation of the solution in tenants where deployment has been unsuccessful. Check the Tenant Status tab. Both the upload and activation of the solution had failed: In this case, you must trigger a restart of the upload of the solution by clicking on Automated Distribution. Both the upload and activation of the solution is automated. Only the activation of the solution has failed: In this case, you must login to the relevant tenant and manually activate the solution. For both the cases, you must check the version history logs for the respective tenants. Deletion Scenarios for the system hosted on same system IDs. When you login to Cloud Application Studio or when trying to open a particular PDI solution in SAP Cloud Studio, you receive the warning message Development of solution YABC_ not permitted as long as backup tenant exists, as below. This warning message occurs in development system, where you have 2 tenants in the same system. Resolution – In this case you should either request for the deletion of the backup tenant or delete the solution from any of the tenant. Then the solution will be in development and will allow you to make changes. Patch creation option will be disabled from implementation Manager. One of the case would be user will to be able to create patch solution as the option of patch creation is grayed out. If an user has triggered a deletion of a solution and if the same solution exists in an another tenant (hosted on the same system) then the patch creation is not possible, this is expected behavior. As the development activity on partial deletion scenarios are not allowed from the backend system. Until the patch solution is deleted from another tenant and once the solution is completely deleted you should be able to create patch solution. Note: In case of any issues while deletion of solution or any leftover objects persistence you may report an incident to SAP. Very Nice Blog Ananat ! !